A modern communication network can be described as a large, complex, distributed system composed by higher interoperating, smaller sub-systems. Today, the proliferation and convergence of different types of wired, wireless, and mobile networks are crucial for the success of the next generation networking. However, these networks can hardly meet the requirements of future integrated-service networks, and are expected to carry multimedia traffic with various Quality of Experience (QoE) and Quality of Service (QoS) requirements. Providing all relevant QoS/QoE issues in these heterogeneous networks is then an important challenge for telecommunication operators, manufacturers, and companies. The impressive emergence and the important demand of the rising generation of real-time Multi-service (such as Data, Voice VoD, Video-Conference, etc.) over communication heterogeneous networks, require scalability while considering a continuous QoS. 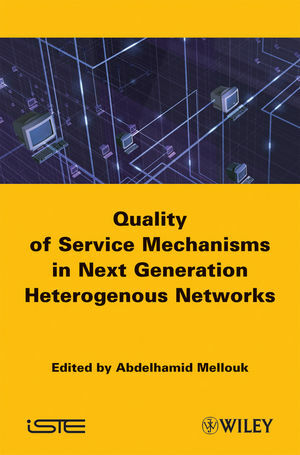 This book presents and explains all the techniques in new generation networks which integrate efficient global control mechanisms in two directions: (1) maintain QoS requirements in order to maximize network resources utilization, and minimize operational costs on all the types of wired-wireless-mobile networks used to transport traffic, and (2) mix the QoS associated with home, access, and core networks in order to provide Quality of Service/Quality of Experience expected by users of new services. Abdelhamid MELLOUK (IEEE Senior Member) is a full professor at University of Paris-Est, Networks & Telecommunications, Department and LiSSi Laboratory, France. Founder of the Network Control Research activity with extensive international academic and industrial collaborations, his general area of research is in adaptive real-time control for high-speed new generation dynamic wired/wireless networking in order to maintain acceptable quality of service/experience for added value services. He is an active member of the IEEE Communications Society and held several offices including leadership positions in IEEE Communications Society Technical Committees.